Dialogue in science is essential for progress. But when dialogue becomes conflict or further intensifies to persecution the situation is harmful not only to science, but also to the wider society in which science exists. This is true whether the conflict is internal, in the case of Boltzmann, or external, as with Galileo and Oppenheimer against their respective authorities. 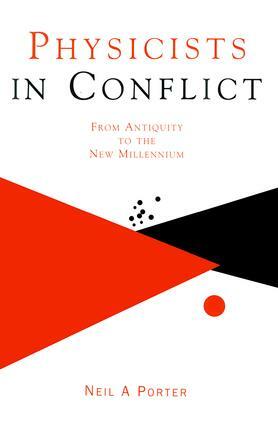 Physicists in Conflict: From Antiquity to the New Millennium examines the nature of conflict in science through examples chosen from the history of physics. These cases fall into three broad themes: physicists in conflict with religion, conflict between physicists on significant scientific issues, and physicists in conflict with each other and politicians on matters of public policy with scientific content. Conflict is singled out as a common element in otherwise disparate areas precisely because it has characteristics that are common to the different cases, and sometimes the similarities are remarkable, such as in the cases of Galileo and Oppenheimer. The book is suitable for general readers with an interest in physics as well as for undergraduate physics students and professional physicists. It will also be of interest to those working in the fields of peace and conflict studies. "…very clear, accessible, and quite accurate survey of a number of fascinating debates within physics."